Description: In 1939, as Poland falls under the shadow of the Nazis, young Alma Belasco's parents send her away to live in safety with an aunt and uncle in their opulent mansion in San Francisco. There, as the rest of the world goes to war, she encounters Ichimei Fukuda, the quiet and gentle son of the family's Japanese gardener. Unnoticed by those around them, a tender love affair begins to blossom. Following the Japanese attack on Pearl Harbor, the two are cruelly pulled apart as Ichimei and his family, like thousands of other Japanese Americans are declared enemies and forcibly relocated to internment camps run by the United States government. 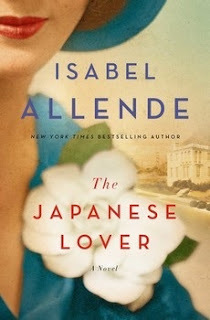 Throughout their lifetimes, Alma and Ichimei reunite again and again, but theirs is a love that they are forever forced to hide from the world. Thoroughly enjoyed the relationship between Irina and Alma. "It depends. I stroke them, and they always like that, because old people don't have anyone who touches them, and I get them hooked on a TV series, because nobody wants to die before the final episode." "Because I have time to spare, and for the first time in my life nobody expects anything of me. I don't have to prove anything. I'm not rushing everywhere; each day is a gift I enjoy to the fullest." "Hearts are big enough to contain love for more than one person."